Alexandre Cyusa came to the Fargo-Moorhead area in the fall of 2010 to attend Concordia College. 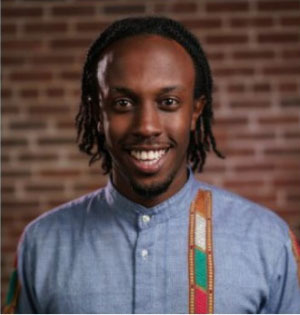 Originally from Kigali, Rwanda, Cyusa has lived in Switzerland, Ethiopia, Guinea, and France. His traveling experiences have helped him in making this world a smaller and simpler place to live in. He currently works for Folkways and is interested in community development and nurturing global citizenship. In this article, Cyusa highlights Folkways, a Fargo company founded on the belief that compelling culture instills a sense of belonging in a community, and their community-building projects. Why move to Fargo? What is there to do for fun in Fargo? Why stay? These are a glimpse of the series of questions someone considers before making this life changing decision: calling Fargo home! Culture creators are proud ambassadors and they are the pulse of our vibrant region. These individuals are often the first people a newcomer or visitor interacts with while in our community. The Christkindlmarkt is three days of festive cheer in the Outdoor Winter Wonderland, Gift Market, and Beer Hall by Front Street Taproom. With food, live musical performances, art demonstrations, mulled wine, holiday treats, and activities for the kids, there’s something for everyone to enjoy. Log the Sauna: We're making the most of Fargo's frigid winters with a traditional Finnish Sauna experience. Interested in following the sauna on its journey? Would you like to rent the sauna for your own gathering of warmth? Join our mailing list or sign up to sauna at our next event at the APT Holiday Market on Dec 21st. The Red River Market is a farmers' market in Downtown Fargo with a mission to create a space for all community members to experience the joys of locally produced food. Join us Saturdays from 10:00AM - 2:00PM July through October. The Canoe Parade connects participants and spectators to the river that has shaped the Fargo-Moorhead area with a procession of decorated vessels. Embracing the constant risk of failure. Personally, when I graduated from Concordia College in December 2014, I wanted to relocate to a big city. At that time in my life I didn't know any better. Some of the reasons I heard from those who already moved away was: there is “more to do” or “more opportunities” in bigger cities. But little did I know that 3 years later I would still be here, in Fargo. What happened to make me stay? The answer is plain and simple: I got involved with Folkways and this was the magnet that prolonged my stay in the Red River Valley. Becoming Folkways’ community liaison in 2015 I started making more and more connections throughout the community. Folkways gave me a purpose to step out of my comfort zone by putting myself out in the community. I can confidently say that now I am a familiar face in the Fargo-Moorhead community. Fargo has unique features of a small town with a taste of metropolitan amenities.